Getting everything together for the Contemporary Handweavers of Houston Annual Sale. 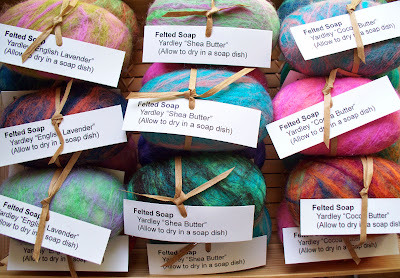 I had so much fun with the felted soap last year so I had to make some more. I also have a couple of kumihimo neckpieces and loomed bracelets to include. 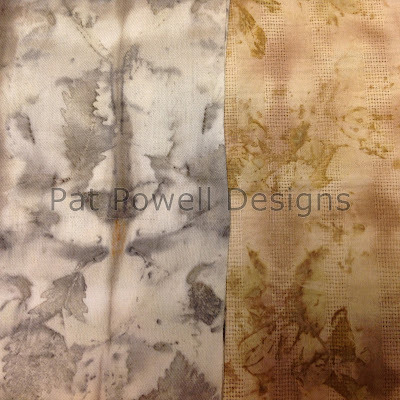 But my very favorite things are the eco printed/dyed scarves I have been making all year. Also managed to get some indigo pieces done. Hope to see some of you there. It’s October 22nd through the 24th at Guild House. Check http://www.weavehouston.org for more details. I was busily tagging all my goodies for the Contemporary Handweavers of Houston sale and realized that I didn’t include pictures of my little felt bags in the last post. I found these very cute little bags in all kinds of colors and couldn’t decide how to embellish them. Then I remembered the wonderful hand dyed mohair curls I got from Kai Mohair (who has the most beautiful goats). 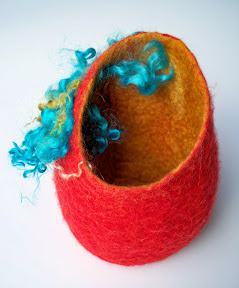 I got out my felting needles and start punching away. The mohair goes all around the bag. I just love the look. Hope everyone else does also. Getting ready for the 2014 Contemporary Handweavers of Houston annual sale. 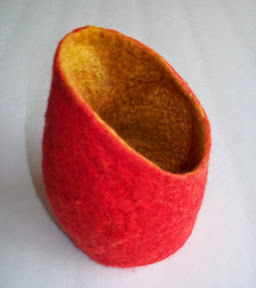 Led an activity at the Houston Center for Contemporary Craft this year making felted soap. Decided they would be a fun ‘little’ thing to have available at the CHH sale. Did some off loom bead weaving to create these wonderful earrings. Even did up a few pair of ear threads. Those always seem to be very popular. Made more loom woven bracelets. I just love making these. They’re like potato chips. ‘You just can’t make one’! I’ll also have a few of my scarves there. There will be an indigo and a couple of eco prints. This year the sale is later than usual. It is scheduled to be next door (Art Studios at 2315 Commerce) to our new ‘home’ (Art Studios at 2323 Commerce)and to be able to participate in the local Art Crawl. I suspect these will be the dates (Nov 20-22) going forward. It should be a fun new experience. Check the CHH website for details (www.weavehouston.org). Created this asymmetrical vessel. Looked good but needed something extra. Added some wonderful mohair curls. Looks like it’s ready to party! This was based on the project the felt study group had last month. Once again I didn’t have the wires exposed at both ends. This time I did, however, wrap the fibers rather than roll them and the bracelet turned out much nicer. I also cut a longer piece of wire to make a multiple wrap bracelet. Gave some thought to embellishing but really like it the way it is. Made another cuff. This was was lined and embellished. Was disappointed the adhesive interfacing didn’t stick as it should have and so was forced to use some fabric glue. Perhaps I’ll just continue to make cuffs without a stiff lining (ultra suede) and consider just a simple fabric lining or no lining at all. Do like the way the embroidery turned out. As my eco printing takes a very long time to process (I have 3 bundles happily fermenting), it seems as though I’ll have plenty of time to work on my other interests. Although I may try some sun and cold processing. Those techniques don’t take quite as long for the results to be seen. Learning a technique often presents you with some interesting opportunities. 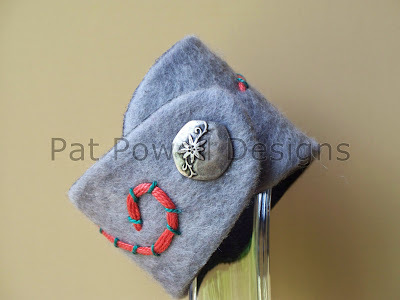 I have made a couple of felt cuffs before but they usually have some kind of clasp to fasten them on. 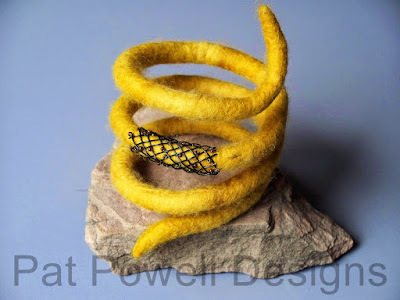 Thought it would be interesting to make a felt cuff that just slipped over the hand. 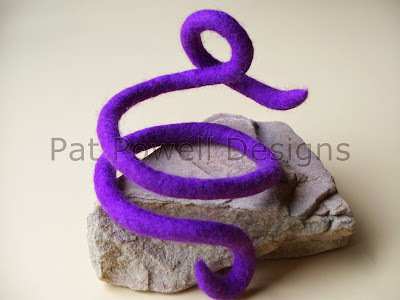 Well not only is wet felting something that needs much practice but calculating correct sizing does also. I followed all the sizing guidelines but found my end result was about 3 inches too large! That is fairly significant. I let the cuff sit for a couple of days and periodically walked past it to give it an analyzing look. I didn’t want to cut off the excess to create another cuff with a clasp so I decided to go ahead and fold over the excess. Looked though my ‘stuff’ for a suitable embellishment and found this wonderful, huge button. Not only did the button need a piece big enough to not be overwhelming but it also needed a surface substantial enough to hold it. 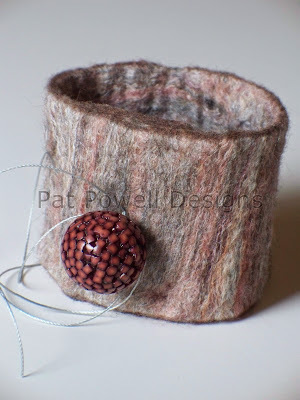 The cuff is approximately 3 inches wide and, with 3 layers of folded-over felt, the button would be proportionate and secure. I like it so much I may make another before adjusting my guide to make the ‘correct’ size.